Package Content : 6 contact lenses in sterile buffered saline solution with up to 0.005% methyl ether cellulose. , the contact lens becomes extra smooth and therefore very comfortable throughout the all-day wear. As an added benefit, the contact lens material itself blocks more than 96 percent of UVA rays and 99 percent of UVB rays, meeting the highest UV-blocking standards expected of contact lenses on the market. 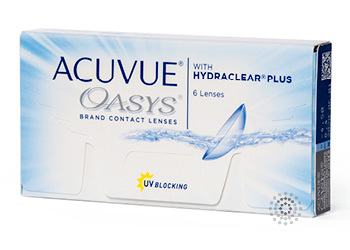 Acuvue® Oasys™is fitted for daily wear use but may also be worn for up to 6 consecutive nights or 7 days of extended wear, depending on the fitting instructions prescribed by your eye doctor. Always follow your eye doctor’s recommended replacement schedule to ensure the continued health of your eyes.